Sudan: The Sudanese Military - a Pawn of the Saudis? Africa: The Women's Football Committee of the Libyan Football Federation Organized the Women's Football League in the City of Benghazi Under 20 Years. Super Eagles train in Asaba. Friday's Africa Cup of Nations qualifying match between Nigeria and Seychelles is a dead rubber tie as the latter already has a ticket to the biennial tournament and the former stands no chance of pulling through. That said, a harvest of goals is likely on the cards as players of the Super Eagles are not willing to take their feet off the pedal and are targeting to end the qualifying series on a bright note. 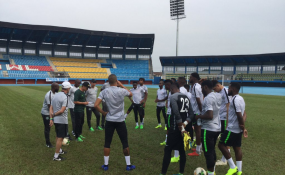 Indeed, confidence is high in the camp of the Super Eagles ahead of Friday's tie at the Stephen Keshi Stadium, Asaba, in what kicks a loaded timetable of football action in the Delta State capital. The Super Eagles cemented their slot at Africa 's biggest football competition far back in November 2018 after a 1-1 draw with South Africa in Johannesburg, but it is understood that the Nigerian stars are looking to rack up a high -score win for bragging rights. That desire has been commended by former Super Eagles midfielder, Friday Ekpo, who told PREMIUM TIMES that no match should be treated lightly. "There is nothing wrong if the Super Eagles win 12-0 on Friday, I want them to take the game seriously just as the coach is taking it. If you see the team Rohr has assembled, you will know that he is not joking" Ekpo stated. Libya's Mediterranean Knights, who are involved in the other match of the group against South Africa in Tunisia, pummeled the Pirates 8-1 right in Mahé Island in one of the group matches. That remains the highest -score win of the entire qualifying series and many are waiting to see the Eagles match same or even surpass that feat. In the first leg tie between Seychelles and Nigeria played in September 2018, goals by Ahmed Musa (a rocket from his weaker left foot), defender Chidozie Awaziem and Odion Ighalo sealed a 3-0 win for the Super Eagles. On Friday, Technical Adviser Gernot Rohr will unleash his best legs, as a high -score win would put the Eagles in a great mood for Tuesday's prestige international friendly against seven-time African champions, Egypt, at the same venue. Twenty -four hours before that encounter, the Nigeria U23 squad will seek to overturn a 0-2 first leg loss to their Libyan counterparts in a 2019 Africa U23 Cup of Nations qualifying first round fixture, also at the Stephen Keshi Stadium. The stand-in skipper, Ahmed Musa, who has led the Eagles brilliantly during this qualifying series has assured of another fine outing by him and his teammates. He said: "Yes, we have qualified already, but there is something called pride. And also, we need to be in the mood for the match against Egypt, and again take this as part of the preparation for the Cup of Nations. The Cup of Nations is less than three months away so our preparation has already started. The bigger picture is the thing." CAF has named Cape Verde official Fabricio Duarte as the referee for tomorrow's match. His compatriot, Jose Carlos Alexandre Pina Mendes, is the assistant referee 1, with Delgade Fernandes Wilson Jorge as assistant referee 2 and Delgado Rocha Lenine as the fourth official. The match commissioner is Martin Gomez from the Gambia, while Togolese Latre-Kavi Edzona Lawson Hogban will be referee assessor. The match starts at 4 p.m. Copyright © 2019 Premium Times. All rights reserved. Distributed by AllAfrica Global Media (allAfrica.com). To contact the copyright holder directly for corrections — or for permission to republish or make other authorized use of this material, click here.